I’ll start this review out with a frank admission: I haven’t used a mouse in years. But if any mouse has made me consider giving up the ol’ Magic Trackpad, it’s the Logitech MX Master Wireless Mouse (US$99.99). The MX Master’s wildly futuristic design, incredible comfort, and capabilities make it the most impressive pointing device I’ve used in years. The design of the MX Master doesn’t match the Apple “standard” design meme, but that’s OK. 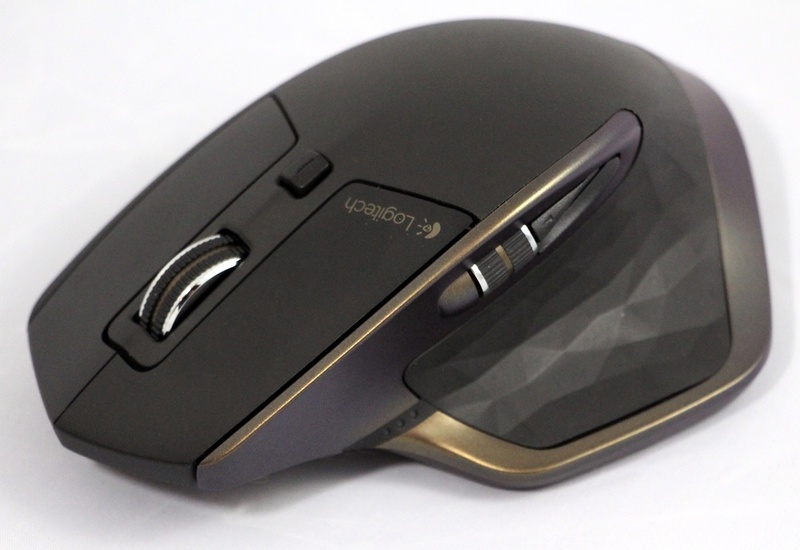 Instead, it features a dark gold and black color scheme with a multi-faceted area where your thumb rests. It looks more like a futuristic spacecraft from the upcoming Star Wars reboot than a computer poinitng device. For a guy, I have quite small hands so I was a bit concerned that the bulk of the MX Master would make it difficult for me to use. That fear was unfounded. The MX Master fits perfectly in a cupped hand, with a comfortable thumb rest and a two buttons right where you’d expect them. There are more than just top buttons, however. There’s a speed-adaptive scroll wheel and a thumb wheel for side-to-side scrolling, both of which are customizable through the Logitech Options application that can be downloaded from the Logitech website. There are a pair of thumb-actuated buttons near the thumb wheel. There’s even a “gesture button” located on the bottom of the thumb. Another button on top shifts between modes. The MX Master uses a rechargeable battery that can be charged for a full day’s use in just four minutes. Charging is done with a standard USB - micro-USB cable that plugs into a socket in the front of the device. While the MX Master is a Bluetooth device (more about that in a moment), in a pinch it can be used as a standard USB mouse by using the same cable. About Bluetooth: Past Logitech mice like the one that my lovely spouse uses have used a proprietary Bluetooth receiver that takes up a USB port. Fortunately, many recent Macs won’t need to use that receiver. The MX Master communicates through Bluetooth Smart. If the System Report on your Mac shows “Yes” next to Bluetooth Low Energy, then it’s Bluetooth Smart ready. On the bottom of the device you’ll find a number of buttons; a power switch, a connect button, and then a button surrounded by the numbers 1..2..3. That last button is used to switch between different computers, meaning that the MX Master can be set up to work on three different machines and connect instantly to them with a push or two of the button. As the button is pushed, the corresponding number lights up. All you need to do is remember which number is associated with a specific computer. One final design feature that’s fascinating is the use of Darkfield Laser Tracking. The laser in the bottom of the MX Master offers precise tracking even on high-gloss surfaces like glass. Setup of the MX Master is very simple with OS X 10.10 Yosemite. I decided to install the “Logitech Options” software just to see how the buttons on the mouse could be customized. The app didn’t see a connected mouse, so I clicked a “connect” button, which launched Settings and brought up the Bluetooth settings page. Turning the mouse on and pressing the connect button on the bottom of the mouse, the MX Master showed up immediately in Bluetooth settings. With one click of a “Pair” button the mouse was working. Scrolling with the scroll wheel was fast and precise, and the wheel required just a light touch to spin. Initially it had some tactile and audible feedback that I wasn’t fond of; with a touch of the mode button that went away and I was able to scroll in silence. The best feature of the MX Master has nothing to do with buttons or settings, though — it’s how good the mouse feels in the hand. As the Logitech website notes, the shape of the mouse “supports your hand and wrist in a comfortable, natural position.” It honestly feels like an extension of your hand rather than a pointing device. The Logitech MX Master mouse is the first non-trackpad pointing device I’ve used in ten years that could make me give up trackpads forever. The comfortable design of the mouse, coupled with fast setup, multiple buttons, precision controls, and the ability to be paired with up to three computers makes it my top pick of 2015 for pointing devices. Purchase the Logitech MX Master on Amazon and help support Apple World Today (affiliate link).